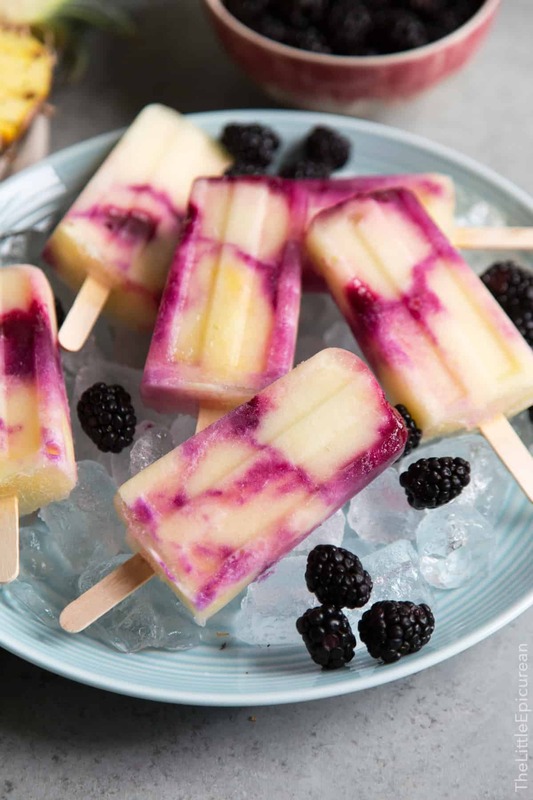 Amp up the flavors of pineapple popsicles with the addition of blackberry syrup. 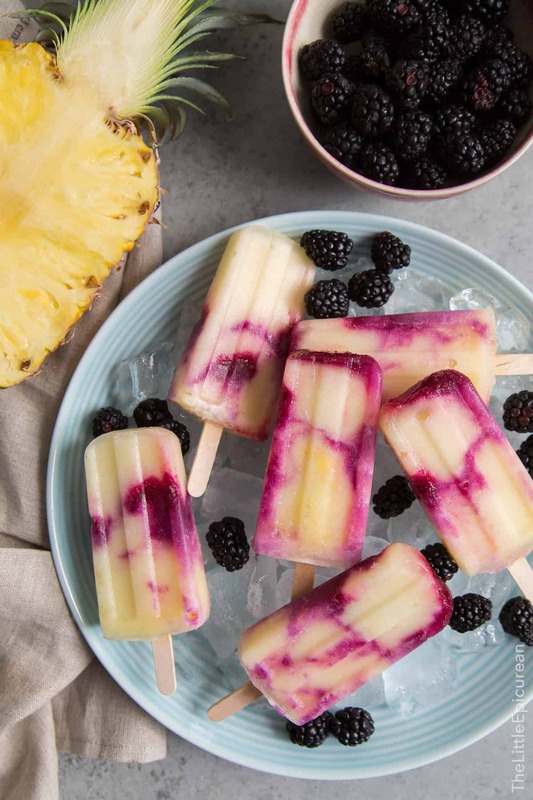 These blackberry swirl pineapple popsicles are a great summertime treat. I don’t get to play tourist in Southern California very often. While there is so much to see and do around Los Angeles and Orange County, I hardly take advantage of it. That’s about to change! This weekend Alex and I are going whale watching in Newport Beach. I haven’t been whale watching since third grade (back in 1993!). I’m hoping we get to meet some dolphins, too. Next week I’m checking out afternoon tea at the Disneyland Hotel with my BFF. After that, I’m taking a little trip to Santa Barbara for a first birthday party. I love this time of the year (maybe even more than the holidays). As we approach summertime, my freezer becomes a popsicle making factory. As the weather heats up, I can’t help but turn everything into an ice pop. Why limit yourself to drinking a cocktail, when you can eat it instead? Example: Lava Flow Popsicles. Want popsicles for breakfast? This kiwi chia coconut popsicle is totally appropriate. Avocado toast is so basic. These chocolate avocado popsicles are not. Earlier this week I shared this blackberry pineapple rum cocktail. I couldn’t get enough of the blackberry syrup, so I used it to amp up these pineapple popsicles. See the little swirls of blackberry? It adds such a nice contrast to the pineapple. Plus, it just looks cool. The secret to getting the swirls to freeze in place is all about density. Similar to how you get the swirls in a lava flow cocktail, one component needs to be heavier than the other. Instead of using fresh pineapples, I used frozen pineapple chunks mixed with pineapple juice to achieve a thick smoothie like consistency. Alternate adding the pineapple mixture and a dash of the blackberry syrup into the ice pop molds. The thick pineapple mixture will hold the blackberry syrup in place. Voila! I foresee many batches of this blackberry swirl pineapple popsicles being made for pool parties and backyard BBQs! Prepare blackberry syrup ahead of time. Place fresh blackberries, sugar, and water in a small sauce pot. Set over medium heat and bring to a boil. Remove from heat. Use a muddler or fork to break up the blackberries. Allow mixture to cool before straining. Keep in an airtight container and store in the fridge for up to 2 weeks. In a blender (or food processor), pulse together frozen pineapple and pineapple juice until smooth. 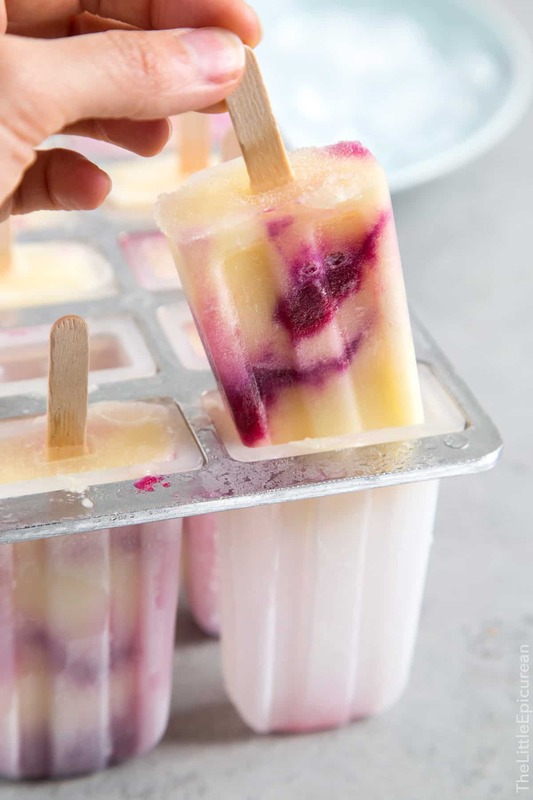 Alternate adding one to two tablespoons of pineapple mixture and one teaspoon blackberry syrup inside popsicle mold until full. Cover mold and insert wooden stick into each cavity. Freeze for at least 4 hours until frozen solid. The blackberry syrup recipe makes more than needed for these popsicles. Save leftovers to sweeten iced teas, or pour over fruits, ice cream, waffles, etc. Love the combination of pineapple and blackberry. Thanks for explaining the trick of creating swirls by alternating densities. Pretty cool results! I am getting these popsicle molds, it will be a long, hot summer! Disneyland Afternoon Tea was a little overpriced, but I enjoyed it and had a great time. However, the one at Disney World is a lot better! I am so with you on the popsicles. You can never have too many during the summer! I love the tip about getting the perfect swirls! And have fun being a tourist!